Telecommunication network diagrams are used by system engineers for planning a network arrangement as well as for network management. Telecom network diagrams can be used to identify weak points of a system and visualize the level of security and user access to certain equipment and data. Telecommunication network diagram represents components and connections in a telecommunications network: how they are interacted between each other and with end-users. The PowerPoint presentation on a conception of telecom network can be very informative and helpful. 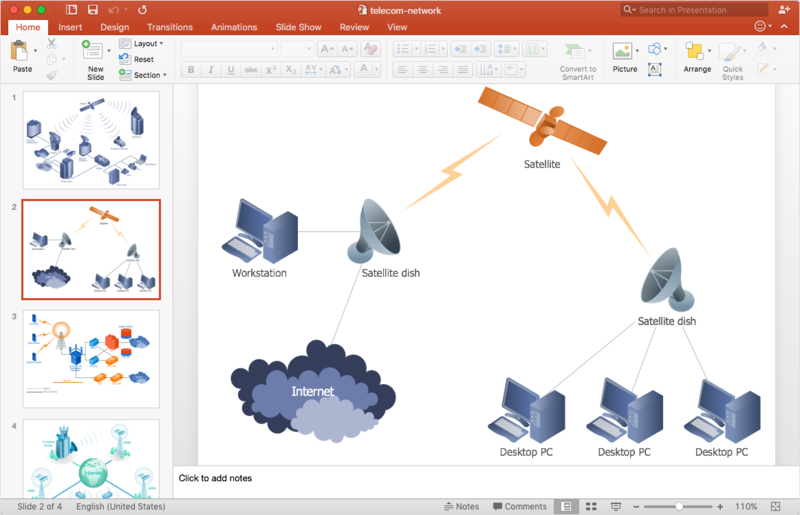 ConceptDraw DIAGRAM allows you to make an MS PowerPoint Presentation from your telecommunication network diagrams in a few clicks. Open a ConceptDraw DIAGRAM new document and the proper library from Telecommunication Network Diagrams section. Add network elements to the diagram. Use Clone tool to quickly add copies of the selected library object. Activate the Smart Connector tool to connect objects. Click the point you wish to originate the connector from, then drag your mouse to the desired end point and release the mouse button. You can add additional pages to a document using the context menu of Page Navigator (View menu). Export your multi page diagram as an MS PowerPoint® presentation using the Export option from the File menu. Result:The PowerPoint presentation of telecom network can be really helpful for computer engineering courses as well as other networking and connectivity presentations.